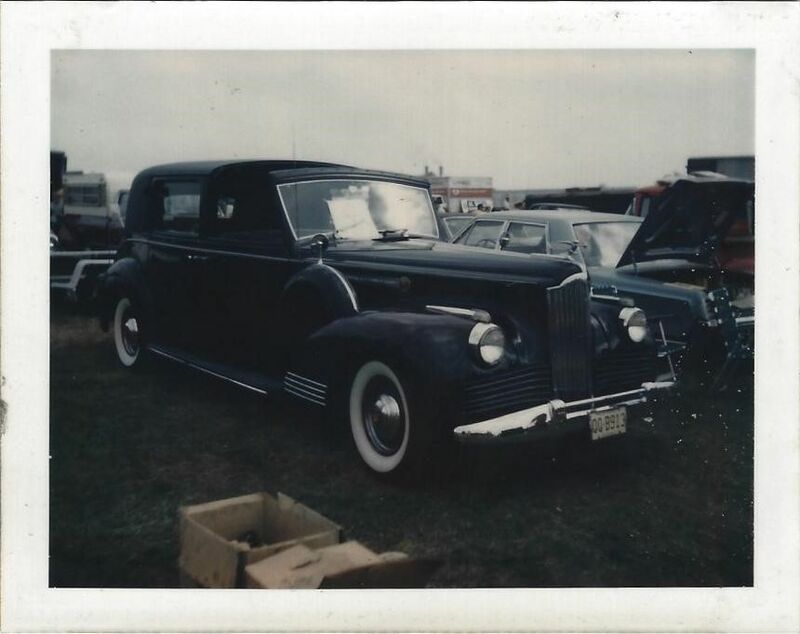 As far as I was concerned, big brother Chuck’s 1941 Packard Model 180 limousine was the classiest Classic at Hershey that year. It also was one of the most handsome cars I had ever seen. It was 1972 and a lousy day for perhaps the largest classic car show in the world. But despite light drizzle, tens of thousands of automobile aficionados turned out to gawk at more than 1,200 beauties assembled in long rows. My first time at the show, Grace and I arrived after driving across New Jersey and half of Pennsylvania in our 1965 Plymouth Valiant. Parking in a large, muddy field, we walked endlessly — it was about a 30-mile hike to see the whole show — along rows lined with classics to locate my older brother, Chuck, and his incredible car. He wasn’t hard to spot. Standing 6-feet, 3-inch and wiping rain off the car’s roof, its black paint looking resplendent, he had just started the flathead eight-cylinder engine. Men interested in buying the vehicle listened intently as it purred while Chuck fielded questions. He knew what he was talking about, too, as he had restored many classics including a Model A Ford, Thunderbird, Cadillac, Mercedes, and others. We walked miles to find Chuck and his 1941 Packard limo. 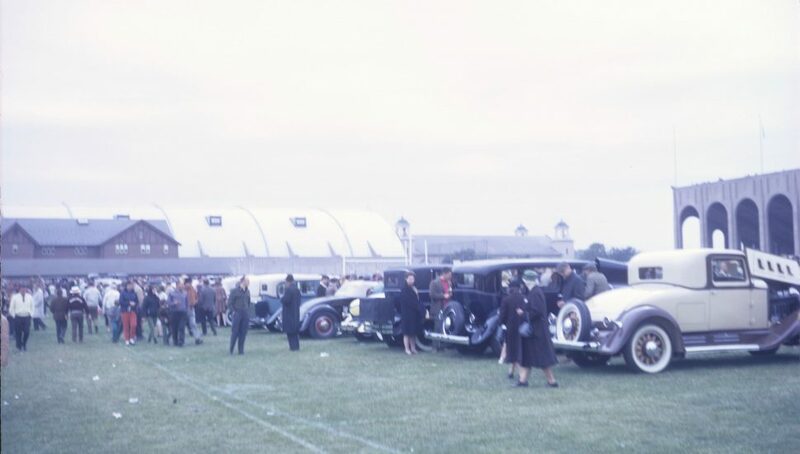 The Hershey, Pennsylvania, classic car show, started in 1955, hosted more than 1,200 cars and vendors from 23 countries. Here we see it in 1967. Hemmings file photo. Design and mechanical features also set the Packard apart. Turn signals were mounted on front fenders. The gearshift lever was moved from the floor to steering column. Decorative chrome strips flanked the vertical grill and lined front fenders. The car made a powerful visual statement. Looking inside the Packard’s trunk, I examined the massive cooling and heating equipment. You couldn’t miss it as it took up about half the trunk space and, according to Chuck, weighed hundreds of pounds (the car tipped the scales at about three tons). Under the hood was a compressor about the size of today’s home window units. Pulleys spun long rubber belts. Hoses snaked through the trunk and connected treated air through ducts between the rear seats and window. It was the “Godzilla” of car air conditioning units. Classic car engines always intrigued me. 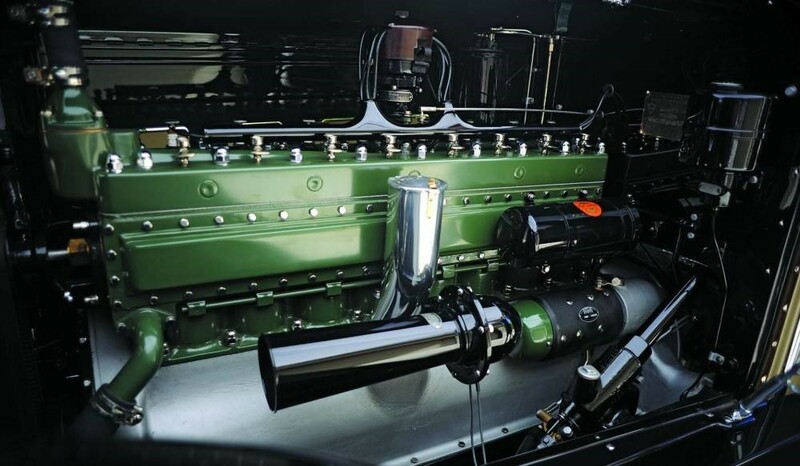 The Packard’s straight-eight — a nine-bearing, 356-cubic-inch, 160-horsepower goliath (the engine and transmission weighed about 1,000 pounds) — was no exception. It was Packard’s heyday and, in chauvinistic fashion, its advertising slogan was “Ask the man who owns one.” I asked Chuck about the engine, which was nearly silent and vibration-free. Someone nearby expressed the old cliché that a coin could be placed on edge and not fall off the intake manifold. It had so much torque, Chuck said, stoplight launches could be accomplished in third gear. I wondered why the car needed first and second gears. Chuck was busy trying to sell the car and I, like others, had many questions. Was that a Tiffany clock behind the roll-down divider window that separated passengers from the chauffeur? Was that the original “Persian rug,” its vibrant colors in bold relief, covering the rear compartment’s floor? Porcelain vases hung from interior window frames. Did the car’s first owner put fresh flowers in them to please his wife or lady friends? What struck me, too, was the car’s immense size. Built on a 139-inch chassis, about the length of today’s smallest economy cars, its 225-inch-long coachbuilt body symbolized status, wealth, and class. Packard’s flathead straight-eight boasted 356 cubic inches and 160 horsepower, providing enormous torque at low rpm. The car could pull away from a stop in high gear. Photo by Jim Donnelly. Black leather seats looked new in the driver and passenger compartments. Their strong, fine-furniture smell reminded me of leather saddles, boots, and gloves. The distinctive fragrance of wood and wax emanated from the dashboard, door sills, and dividers. Gauges and instruments were simple, yet classy with flashy chrome accents. 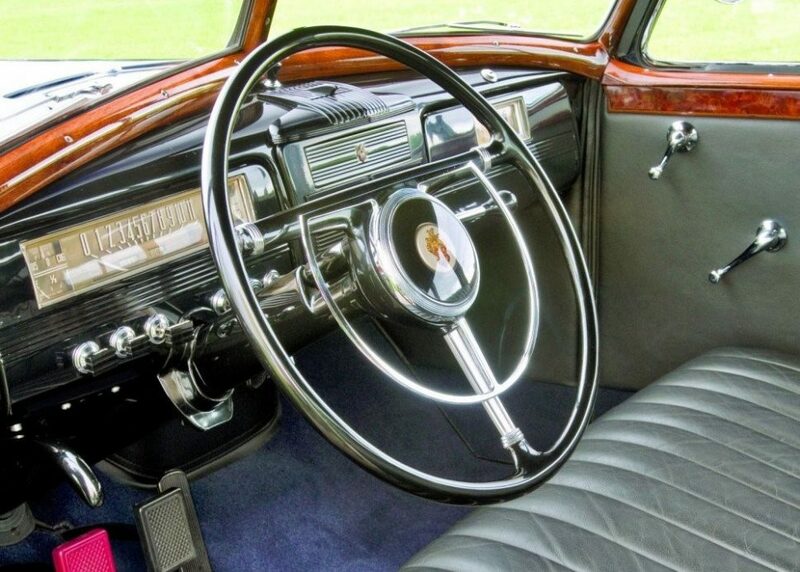 The 1941 Packard’s interior smelled of fine leather and polished wood. Photo by Jim Donnelly. Exterior design accents were both functional and stately. Tire sidemount covers were topped with dual mirrors. A trunk rack, undoubtedly well used due to limited storage space, was positioned above the rear bumper. An exciting innovation at the time was turn signals mounted on front fenders. On some models, yellow fog lamps completed the package. Despite being the first auto manufacturer to offer an air conditioner, Packard’s $279 “Weather Conditioner” option — which did an admirable job of cooling and heating the car’s interior — was short-lived. 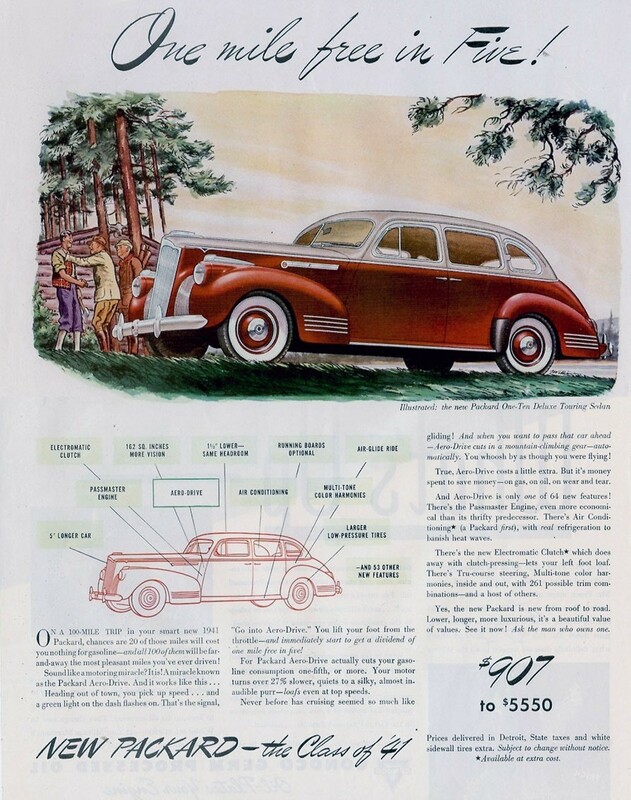 1941 Packards offered features ranging from air conditioning to an “electromatic clutch.” The car’s base price was $907. Fully-loaded models had a $5,500 price tag. Image courtesy Packard Proving Grounds Archives. Although Packard made about 1,500 air conditioned cars, the A/C system was dropped after 1942. A shortage of Freon at the onset of World War II made it necessary to use methyl chloride, a poor substitute. The unit wasn’t as convenient as today’s car A/C systems because the driver had to remove the compressor’s belt in winter to avoid having it run all the time. Brother Chuck did an impeccable restoration after stuffing the Packard into a rental truck and hauling it to New Jersey from Detroit. He oversaw every stage of the frame-off project, which took months and saw every nut and bolt brought back to perfection. Perhaps his love of Packards started when he was 17. My favorite memory of Chuck and his future wife, Muriel, had to do with our Uncle “Bud,” who was visiting around the time the couple started dating. Learning they were going to a dance, Bud asked Chuck for permission to play a joke on Muriel. Dressed in chauffeur’s clothing, Bud drove Chuck to Muriel’s house in a black Packard. When Muriel opened her front door she was greeted — and shocked — by the enormous car and Chuck’s “driver.” Bud drove them to the dance and never let on — until later that evening — that he was Chuck’s uncle. Packard offered several models in 1941, including custom limousines with subtle styling differences. This one had a larger trunk than my brother’s. Photo by Jim Donnelly. I laugh when I remember Chuck’s reaction the day he showed me the paint job on his 1968 Mercedes 190 convertible. As we walked from his house to a barn where the car was stored, he told me about the expensive and time-consuming restoration. I couldn’t wait to see the Mercedes and watched Chuck open the barn doors. The first thing we saw, to our horror, was a big blob of bird “caca” on the hood. Looking up, we identified the source. Pigeons roosting in the loft were pooping with frequency, their caca falling through a hole. Chuck quickly hosed off the hood and moved the vehicle. 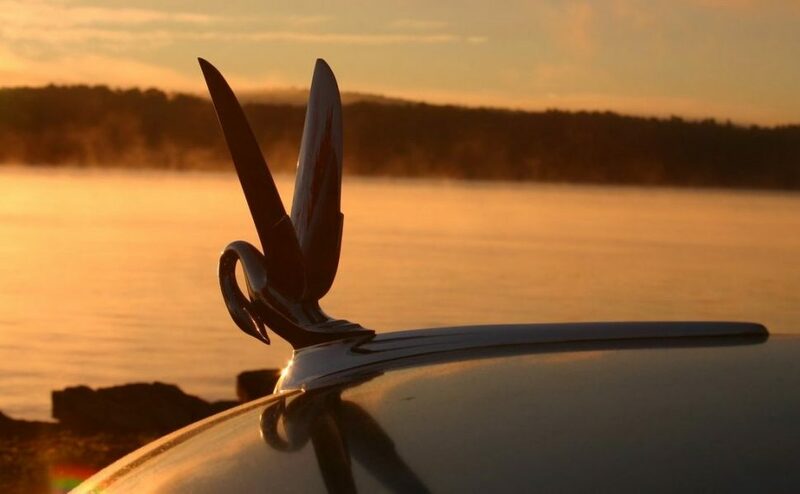 Perhaps the most memorable car hood ornament: Packard’s cormorant. Photo by Mark J. McCourt. Before selling the Packard to a wealthy Georgia doctor, Chuck took Muriel and their four children on several journeys in the car. He enjoyed driving it and donning a chauffeur’s hat, his family sitting in comfort behind the window partition. I’ve often wondered who owns Chuck’s Packard limo today. It was a grand car restored — and enjoyed — by a great brother.